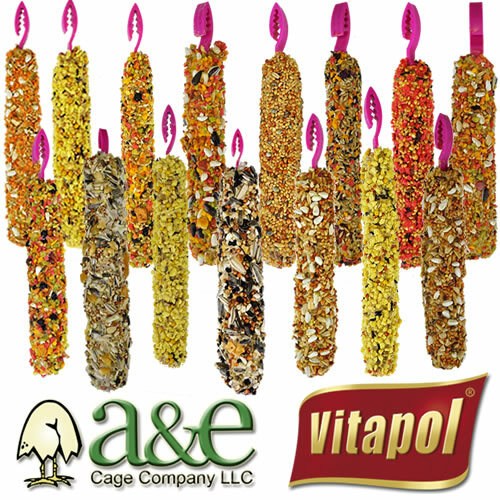 Vitapol Smakers bird treat sticks from A&E Cage Co.
Smakers Egg Finch Treat Stick 2pk - A&E Cage Co.
Smakers egg finch treat sticks are created with high quality, natural ingredients that supplement and compliment your feathered friend's daily diet. Smakers Fruit Finch Treat Stick 2pk - A&E Cage Co.
Smakers fruit finch treat sticks are created with high quality, natural ingredients that supplement and compliment your feathered friend's daily diet. Smakers Egg Canary Treat Stick 2pk - A&E Cage Co.
Smakers egg canary treat sticks are created with high quality, natural ingredients that supplement and compliment your feathered friend's daily diet. Smakers fruit canary treat sticks are created with high quality, natural ingredients that supplement and compliment your feathered friend's daily diet. Smakers egg parakeet treat sticks are created with high quality, natural ingredients that supplement and compliment your feathered friend's daily diet. Smakers strawberry parakeet treat sticks are created with high quality, natural ingredients that supplement and compliment your feathered friend's daily diet. Smakers parakeet variety 3 pack treat sticks are created with high quality, natural ingredients that supplement and compliment your feathered friend's daily diet. Smakers fruit cockatiel treat sticks are created with high quality, natural ingredients that supplement and compliment your feathered friend's daily diet. Smakers nut cockatiel treat sticks are created with high quality, natural ingredients that supplement and compliment your feathered friend's daily diet. Smakers Orange cockatiel treat sticks are created with high quality, natural ingredients that supplement and compliment your feathered friend's daily diet. Smakers nut parrot xxl treat sticks are created with high quality, natural ingredients that supplement and compliment your feathered friend's daily diet. Smakers coconut & nut maxi parrot treat sticks are created with high quality, natural ingredients that supplement and compliment your feathered friend's daily diet.